My husband subscribes to three golf magazines. I don't play golf (At least, I wouldn't claim the couple times a year that I go tear up grass and awkwardly swing around some golf clubs as really playing.) but occasionally I'll flip through some of the golf magazines when they're sitting out and hope that just by reading about golf I will be able to play it better. (It hasn't worked yet.) 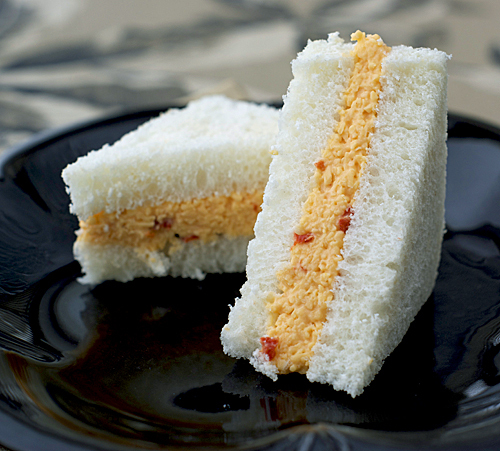 One time I was flipping through once such magazine and they had a whole article on these pimento cheese sandwiches that sold like crazy during the Masters in Atlanta. "What the heck is pimento cheese?" was my first thought. And then, "How can there be a cheese product I've never heard of before?" A little googling showed that pimento cheese is mostly a Southern thing, which might explain why I had never heard of it, and why anyone from the South who is reading this is probably wondering who hasn't heard of pimento cheese before. The ingredients for it can vary, but nearly always include yellow cheddar cheese, some mayo, pimentos (usually sold diced in jars, most famous for being the stuffing for green olives) and salt and pepper. The most common use for it is in sandwiches on white bread with the crusts cut off, but it can be used as a dip on crackers or on pretty much anything that would benefit from cheese. Although you can buy it pre-made in the grocery store (even out here in Utah, I've since discovered) it looked easy to make from scratch, so armed with my internet knowledge, I whipped up a batch from one of the most basic recipes I could find and gave it a try. Hello, new cheese-y friend. Come join your cousins herbed cheeseball and grilled cheese. I'm happy to have you in my life. Pimento cheese is good. Good in a comfort food, I-shouldn't-be-eating-this-but-I-like-it kind of way. It's cheesy, it's salty and it does taste good on sandwiches and crackers alike. I played around with the original recipe I had tried and included some parts of other recipes I had seen to come up with my personal favorite version of pimento cheese. Judging from how many recipes for it I found online, I imagine everyone has their own personal favorite version of pimento cheese, so I'd encourage you to give it a try and adjust my recipe to how you like it. I've tried this recipe with some reduced fat mayo and the reduced fat Cabot cheese I won. Still good, just so you know. 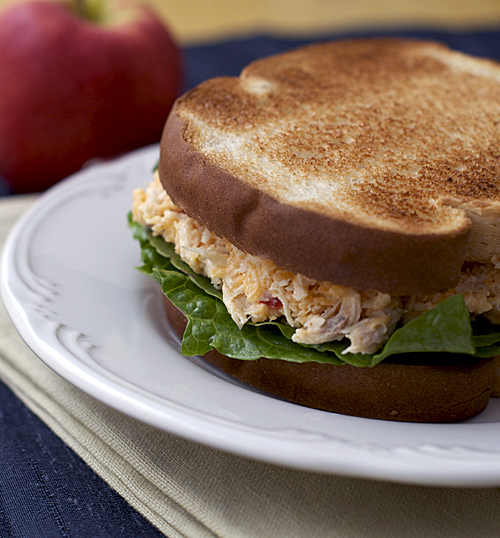 My favorite tweak I made, though, was making the pimento cheese into a chicken salad, and that's the recipe I'm sharing today. I added a little more mayo and some shredded chicken, and it makes one of the best chicken salads I've ever had. It has tons of flavor and isn't as egg-y as other chicken salads I've made, which is good if you're not a huge mayo fan. It also holds together well in a sandwich, which is good if you're not a huge oops-I-dropped-a-mayonnaise-coated-piece-of-chicken-on-my-shirt fan. 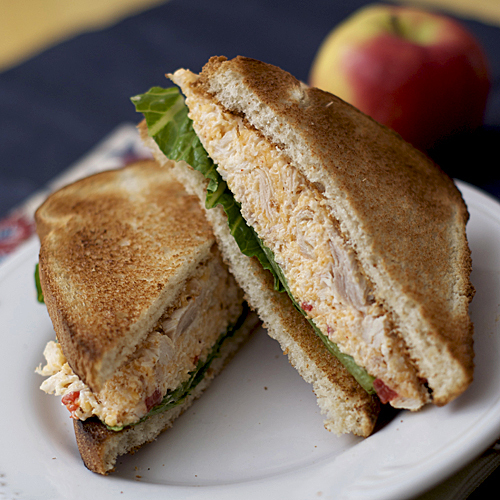 My favorite way to eat the chicken salad on toasted bread with some lettuce. It's a delicious twist on a tasty comfort food. * Pay attention to the sodium content of the cheese you use. Some are higher than others, especially with low-fat cheeses, and I found certain brands of cheese made the end result too salty. In a medium bowl, combine cheese, 1/2 cup mayo, pimentos, onion powder, mustard, cayenne pepper and chicken with a large spoon until well combined. Add remaining 1/4 cup mayo as needed to get the chicken salad to desired texture. (Usually the more finely shredded the cheese the more mayo you will need.) Add salt and pepper to taste. Spread about 1/5 of mixture onto a piece of bread, top with a romaine leaf and another slice of bread. Repeat with remaining ingredients and serve.